I am honoured to receive the 2013 Canadian Law Blog Award naming this site as one of the Best New Law Blogs of the year. Thank you to everyone who nominated this site, to Steve Matthews, Simon Fodden and Jordan Furlong for the award, and to everyone who has visited in 2013. So how do you celebrate an award as prestigious as a “Clawbie”? If you follow my BC Injury Law blog you’ll be familiar with my tradition. Given that this award is handed out on New Year’s Eve I see no more fitting way t0 celebrate than a Polar Bear swim. 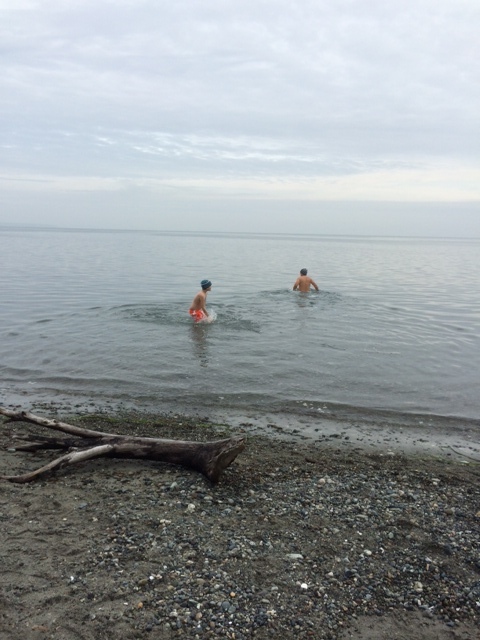 This year my local lake was closed for swimmers so I opted for a dip in the Canadian Pacific. As always I was fortunate enough to have my oldest son join me in this questionable tradition. Thank you to all my readers and have a wonderful 2014! Is Ontario Selectively Prosecuting MMA Events?